It looks like GTFO, the creepy co-op action/horror game unveiled at the Game Awards, will be set in the Chicxulub Crater, in Mexico’s Yucatán peninsula. Face gaming’s many terrors together in the best co-op games on PC. The evidence is right there in the gameplay trailer from the Game Awards. At 24 seconds, the words ‘Demon Tick’ flash, and at 42 seconds, a set of coordinates (21°08’57″N 89°29’32″W) appear. Those coordinates take you just outside the town of Chicxulub, which roughly translates (from Yucatan Maya) into ‘Demon Tick’. Credit for the discovery goes to Steam user VEF215. The Chicxulub Crater was formed 66 million years ago by the asteroid that supposedly killed off the dinosaurs. A team of scientists has recently drilled for rock samples there. 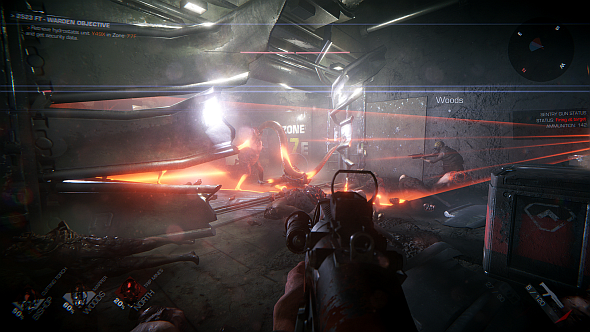 GTFO’s Steam pageshows a four-player party tussling with gross, tentacled monsters in a series of gloomy subterranean locations. It’s due out some time this year, and is being developed by some of the people behind the Payday games.